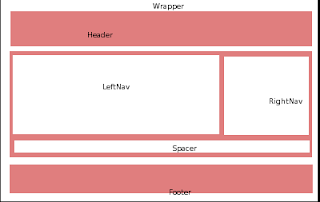 This article describes about how to design page's layout for your site using css.While creating our rails application in views folder structure we will be placing our layout files in Layout folder.Then we be keeping our css files under the public/stylesheets folder. In this way our index.html.erb knows the information about page design and css. Before you proceed, it's useful to have an idea about page's sections. The width of inner elements is set to auto,height is upt o you.